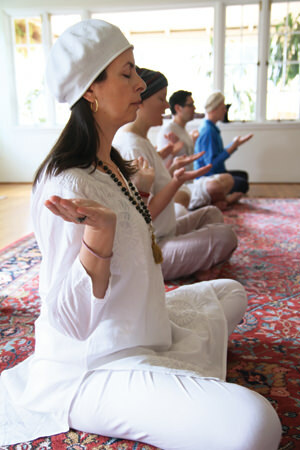 The KRI Level One Aquarian Teacher Curriculum is a 220-hour professional certification program in Kundalini Yoga as taught by Yogi Bhajan®. An interactive course in the theory, practice, and basic skills of a Kundalini Yoga instructor, it includes 180 hours of classroom instruction, 40 hours of independent study, a 40-day meditation, and White Tantric Yoga. Graduates of Level One earn the title of KRI Certified Instructor of Kundalini Yoga as taught by Yogi Bhajan® and fulfill the Yoga Alliance RYT (Registered Yoga Teacher) 200-hour requirement. Level One introduces the student to the principles and practices of the self-aware and empowered human, and explores how Kundalini Yoga and yogic lifestyle can harmonize and uplift the human experience and awaken your true potential.